The film Hyde Park on Hudson is in many ways one of the more underwhelming films of the 2012 film season. 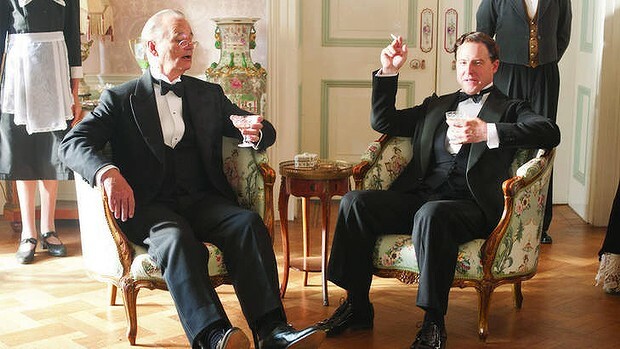 The film is primarily about a weekend in 1939 when the King and Queen of England came to the United States to visit Franklin Delano Roosevelt (played by Bill Murray). The film's primary focus though is on FDR's infidelity, primarily with Daisy Suckley (played by Laura Linney), a fifth cousin of FDR who lived in the area of the Roosevelt family's county estate, Hyde Park on Hudson. Daisy's journals and letters create much of the historical details to tell the story, but while the film focuses on this relationship, I found it to be the far less intriguing plot in the film. Instead, I truly enjoyed the story of the interactions between FDR and King George VI ("Bertie" played by Samuel West). Both FDR and Bertie are portrayed as people of power who also have real weaknesses. In the case of FDR he has his clear physical weaknesses as a result of the paralysis caused by his polio, but it is very clear that his relationships, particularly with his wife is significantly strained and complicated by his moral indiscretion. Similarly, Bertie has his problem with stuttering, and general confidence issues that create strain in the way that he leads England. This insecurity is portrayed in full force as his wife (Queen Elizabeth portrayed by Elizabeth Colman) really lay on stress by trying to encourage her husband to make decisions through the lens of his brother who had abdicated the throne. And it is in these positions of weakness, that to me the best scene of the film is when FDR and Bertie are able to have a candid conversation in Roosevelt's study. Roosevelt far more confident even get's up from his chair and very awkwardly slides himself across tables to his desk to offer Bertie a cigarette. There is a moment of incredible bonding in the mutual acknowledgment of weakness. 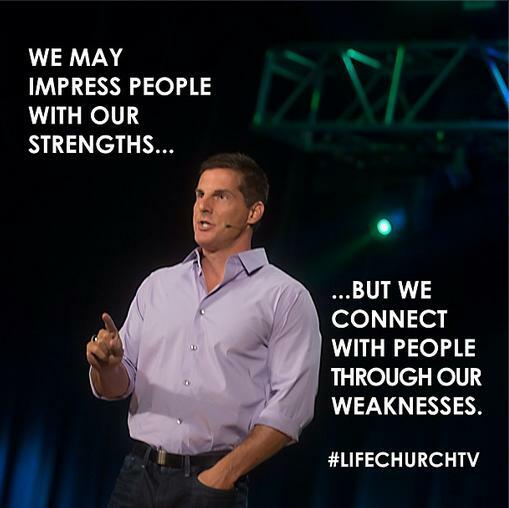 The other day on Instagram I saw the a graphic posted by LifeChurch.TV paster Craig Groeschel that appears to be connected to their current teaching series on frindship. The quote reads: "We may impress people with our strengths...but we connect with people through our weakness." I find a lot of truth in this message, and thank that when it comes to developing friendship that connection happens more in acknowledging our weaknesses. 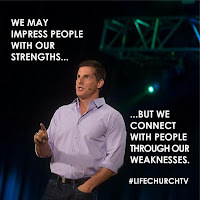 I'm not sure how Groeschel discusses this topic in his teaching, but there are so many different types of weakness -- some that can be tackled and some that will always exist. In the case of Hyde Park, Roosevelt's physical limitations were not something that could be "fixed," but there is other character issues that it is unfortunate FDR did not seem interested in improving. Once weaknesses are identified, friends can either help you get past your weakness, minimize the impact of your weakness, or live in your weakness. There's reason to be afraid of our weakness. Fear to ask for help, even if irrational. The other day I was buying groceries and when the put them in the cart my groceries took up two carts instead of one, and they asked if I needed help out. At first I said "no" when in reality I clearly couldn't get to full carts out by myself. The sixteen year old kid was forward enough to grab the second cart and say "I don't mind, let me help." And he did. 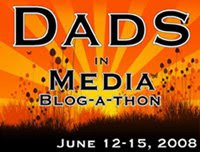 For some reason we've been trained to present ourselves to the world as people who don't need help, people who can figure it out, and maybe there's no need or benefit to broadcasting our weaknesses to the world. But we need friends. And when it comes to our individual relationships with people, there's certainly a lot of room in many of our lives, my own included, to let down our guard and be honest with one another (and ourselves) and expose areas were we might be weak, or just need a hand (or a friend).